Villa Taburiente, modern, breathtaking views, nature and good weather. Villa Taburiente is a modern and exclusive newly built villa with stunning views of the Aridane Valley and the Atlantic sea, is located near the National Park Caldera in the town of El Paso. The house has 4 bedrooms, 2 bathrooms, office, utility room, lounge kitchen of 70 m2 and 65 m2 outdoor pergola. 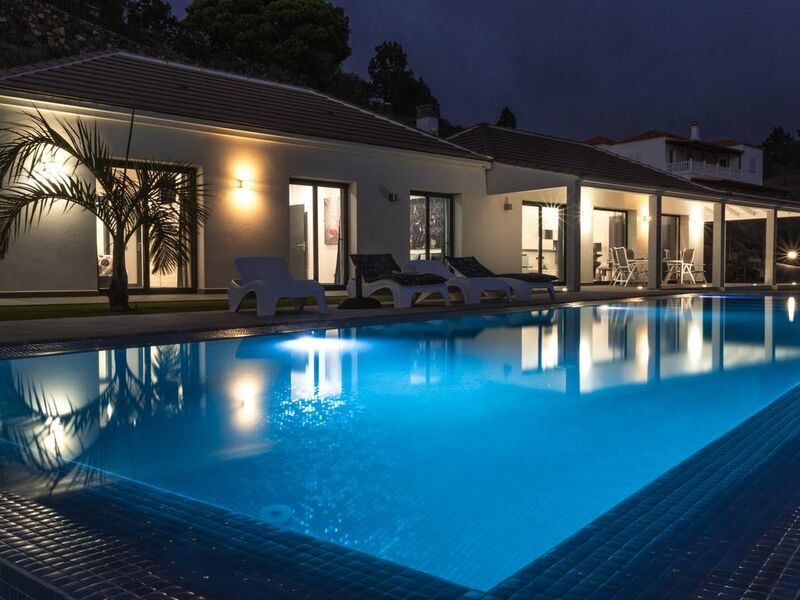 The Villa has an area of ​​250 m2 and exteriors fully adapted within a plot of 2200 m2, has a "not heated" pool (14m x 3m) which includes a shallow end for children. There is a solar shower by the pool, deck chairs, parasols, barbecue and covered terrace with table and chairs. The villa is just as described. We thought it was something from a movie. It was stylish inside and out and the hospitality first class. If the pool was heated and the road to the villa an easier drive we would have given 5 stars. We loved the villa - super clean, stylish and spacious with beautiful views. We enjoyed our time at the villa and on La Palma immensely. We really didn’t want to leave! The villa is stunning and it really has everything you could want - Francisco is a very generous host. The only thing we could think of that is missing is a milk jug, so that says it all! We loved the kitchen in particular - it felt like we were cooking on TV cookery show. The villa is perfectly placed for walking in the Caldera - you can walk straight from the door. There is a casual bar/restaurant within 10 mins walking distance which is really popular, has excellent views and a large menu. It doesn’t have much for vegetarians though, so we can’t review the food, but it was a great place for coffee and cake or a drink! Otherwise it’s a 10 min drive down to Los Llanos where there are loads restaurants, supermarkets etc. The last 200 metres of the road to the villa and the drive itself do seem a bit hairy the first time, but if you go slow, both are perfectly fine. We really loved the island of La Palma. We did four walks and all were clearly sign-posted and beautiful in their different ways. We particularly loved walking along the parts of GR 130 from Tinizara - Puntagorda - Las Tricias - Buracas. Relatively speaking, not too difficult, and with an amazing cafe called Bio Cafe Aloe at the end in Buracas! We have just returned from a two week stay in this wonderful villa and enjoyed every minute of it. It is furnished to a very high standard. The infinity pool and views are very special. Francisco and his daughter could not have been more helpful from booking taxi’s to checking in with us that we were enjoying our stay. Fantastic location being very close to the national park. We will certainly book to stay here when we return to the beautiful island of La Palma and would recommend to anyone looking to visit. Thank you again Francisco and Sara! Lisa, Tim and their family are great guests, communicative at all times, kind, and respectful with our Villa. They have left the house in perfect condition. They will always be welcomed. Amazing views; wonderful location and fantastic house on the Isla Verde! A group of 6 adults and 2 children stayed for 5 wonderful nights at Villa Taburiente. Everyone loved the amazing views and infinity pool. The house was beautiful, new, modern and spacious, with a large kitchen and living room for all to hangout in. There was also plenty of seating for everyone. Three of the four bedrooms have views out to the pool. Outside sits a nice patio with a table; a great spot for eating with the amazing views. The pool was not heated, but we enjoyed it everyday and even nights. We spent our vacation traveling around the island to see all it has to offer and felt that the location was ideal for that. The house is close to Tazacorte and Puerto Naos for beaches, Caldera Taburiente for stunning views and hikes. As well as Cumbre Vieja for hiking or star gazing. It is also close to restaurants and markets. Then there is plenty more to see with a reasonable and beautiful drive's distance. The host was checking in and very helpful with any questions we had. They even left us some gifts from the island, which was very pleasant to arrive to, especially, the cold beer and wine! We would all highly recommend this house to rent; there is nothing its lacking. If we come back to La Palma, we will return to Villa Taburiente! Das Haus hat unsere hohen Erwartungen noch übertroffen. Ein tolles Begrüßungspaket, perfekte Möbel, alles vom Feinsten. Im Haus ist alles, bis zu nützlichen Kleinigkeiten, vorhanden, was man sonst sucht. Der Außenbereich ist ebenfalls phantastisch, an dem wunderbaren Blick von der Terrasse kann man sich nicht satt sehen. Einziges kleines Manko ist die Baustelle nebenan. Vielen Dank an Francisco für seine hervorragende Unterstützung. Norbert ,gracias por tus comentarios y por cuidar de la Villa. Der erste und auch der letzte Eindruck der Villa war einfach nur Wow. Die Villa ist einfach nur traumhaft und mit allem Zipp und Zapp ausgestattet. Es blieben keine Wünsche offen. Wir haben mit 5 Erwachsen dort unseren 14 tägigen Urlaub verbracht... und mehr als genug Platz gehabt. Die Aussicht ist gigantisch, egal ob da der Blick auf den Atlantik , auf Los Lianos oder auf die Caladera de Taburiente zu erwähnen sind. La Palma ist eine entzückende Insel mit vielen unterschiedlichen Facetten und der richtige Ort, um die Seele baumeln zu lassen.